Public beta of mobile Customer Portal now available! Is it really Murphy’s Law at play on days I forget my smart phone? The train doesn’t leave on time, I’m going to miss the connecting bus, and to top it, I can’t check on my phone when the next one leaves. All conceivable emails flood my mind instead of my Inbox, and I’m not even sure if I should be in a meeting at that moment. Or maybe it’s not Murphy’s Law at all, it’s probably regular law at play – what we call our normal routine life. We feel less uncertain and anxious – that’s what being mobile is all about. We are secure in the thought that no matter where we are, and how unpredictable the situation turns, we are always connected and in control! Current websites are often not designed for use with mobile technology. Their layout is too big for the screens of handheld devices, the images take too long to load, and we’re not even talking about the underlying technology. Mobile websites are designed specifically for smaller displays, and accessed over the Internet, typically using Wi-Fi, 3G, or 4G. From checking transportation schedules, weather updates, restaurant reviews, to making reservations and online shopping – optimizing your website for mobile use is definitely the way to go. For me, as long as I am mobile, I really don’t think much about mobile-optimized websites and their benefits – I just take the optimization for granted! But there are many reasons for businesses to optimize their websites. Here are a few of them, courtesy of the enthusiastic explanations I received from some of the heavy mobile users within Leaseweb. User experience – As the products and services available over mobile are precisely designed for handheld devices, it provides you with an enriched user experience. Convenience – No need to rush to your computer to get stuff done – you can do business over your phone while on the move! Brand – By launching your services over mobile, you create a brand identity by standing out as a contemporary organization. Reach – You generate more business as it is done anytime, anywhere! Globally recognized organizations such as Leaseweb, with their focus on customer satisfaction, considered all these benefits before launching the beta version of mobile-optimized Customer Portal environment to the public. 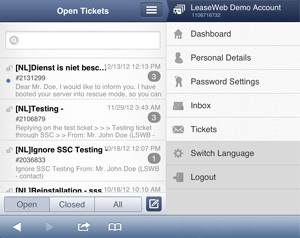 This Christmas, we give you “beta” control over https://m.secure.leaseweb.com! With the launch of the public beta, you can stay connected with your Leaseweb products and services 24×7. We will continue to make more features available in the mobile Customer Portal environment, all with the same enriched user experience. From managing your settings and Inbox notifications, to filing tickets and other functionalities – everything is just a mobile-click away. Let us know what you think in the comments below, or send your feedback directly to support@leaseweb.com. « Leaseweb Cloud: now available in Germany!